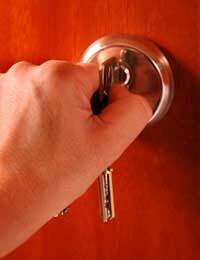 Proper locks are a vital step towards keeping burglars out of homes. Most household insurance policies require a 5 lever mortise deadlock to be fitted in the front door. The locking mechanism slides into a slot in the door frame and can, generally, only be locked or unlocked with a key. Doors may also be fitted with additional bolts and other mechanisms to prevent the door being opened. Many security experts say that all external doors should be fitted with mortise deadlocks. To provide the required level of security these locks should carry a British Standard 3621 kitemark and be fitted 45 to 60 cm away from the Yale, or rim, lock. These locks provide little protection on their own as they can easily be opened from the outside without a key. In addition, if there is a window near the door, a burglar can gain access by breaking the window and then reaching in to release the latch. These lock automatically when the door is closed and can only be opened, from the inside or the outside, with the key. Whilst avoiding the risk that a householder will forget to lock the door when they leave the property this does come with the danger that someone could be trapped inside if they did not have the key. Whenever fitting or using locking systems thought should be given to how occupants would escape in case of a fire. These are operated by a combination of lifting the door handle to activate the bolts and a key or knob to lock them in place. Several bolts will be fired at the same time making the door especially secure. The advantage is added security with very little effort. These locks are complex and will have to be fitted by a specialist. External doors should, at the very least, be fitted with bolts at the top and the bottom which slide into the frame and are key-operated. Special care should be taken with French windows. These should always have individual bolts at the top and bottom that slide into the frame - not into the other door. A bolt that runs between the two doors offers very little protection. Patio doors are also vulnerable - unless they are already fitted with a multi-point locking system they should have an anti-lift device put in, so that they cannot be lifted out of their tracks, and bolts fitted at top and bottom. Any accessible window that is large enough to get a human head through should have a secure lock which can only be opened with a key. The sight of a lock may be enough to deter a burglar as he knows that he risks attracting attention if he has to break the glass and that he may cut himself while climbing through the window. Casement locks mean that windows can only be opened with a key. Fanlight locks use a metal bolt to prevent the window being opened with the handle - and should be lockable with a key. Further security can be given by fitting a device which prevents the window from opening beyond a certain point. This will reduce the risk of intruders breaking in when the property is occupied. However, it should not lead to complacency; windows should still be shut and locked while the property is empty. Louvre windows are very vulnerable as the individual glass slats can easily be removed. The slats can be glued into place to provide some extra protection but preferably the window should be replaced. Garages should always be kept locked. Depending on the type of garage door this may be done with a padlock or an integral lock. Garages with up-and-over doors can be made more secure, from the inside, by drilling a hole through the running mechanism above the wheel and putting a padlock through it. This will prevent the door being opened. If there is a gate leading to the side or back of a property this should be high enough to make it difficult for people to climb over. The gate should be at least about two metres' high and should also be kept locked shut. Most burglars would prefer to gain access through the back of a property because that way they will not be seen while they work at breaking in. They would have to be superman to bend a garage door out - Nonsense and hearsay . Your advice on up and over doors is unfortunately worthless.The preferred method of entry is to pull the door up from the bottom and simply bend it outwards...quite easy actually. To defend yourself secure two bolts one each side of the BOTTOM of the door.